Santa has Rudolph. Charlie Brown has Snoopy. Even the Grinch has Max. 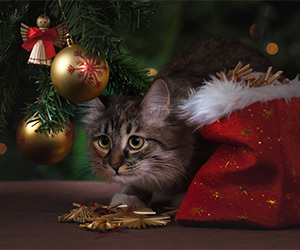 It’s only natural to want to include our furry, feathered and maybe even finned family members in holiday celebrations. That’s easy when it comes to sharing turkey with your kitty, but posing a petulant pet for a greeting card photo, well, that may take a bit more planning. Sharpshooter Jamie Pflughoeft, owner of Cowbelly Pet Photography in Seattle, believes the results are well worth the effort. “If you can send a card that makes people smile and adds a bright spot to their day, then that’s a gift in and of itself,” says Pflughoeft, who has been photographing cats and dogs professionally since 2003. We asked Pflughoeft to share her top five tips for making your own four-legged photo session as easy as pumpkin pie. “To get your pet to look at you, don’t call his name, because that could make him come to you,” she says. “Instead, make some noises, like imitating a dog bark, a bird chirp or even a sharp ‘eee eee eee!’ ” You can also use a squeak toy, but Pflughoeft says that you should squeeze it only once or twice — or you risk losing your pet’s interest. Once you’ve captured that perfect shot, you can tame stray whiskers using Photoshop Express Editor. The program is available online for free and it allows you to crop, adjust exposure and sharpen images. Several companies offer photo card templates for animal lovers, including minted.com and simplytoimpress.com. And, yes, there’s also an app for that: Sincerely Ink holiday cards are available via iTunes for the iPhone and iPad. The app is free, and each card sent is $1.99 with postage.